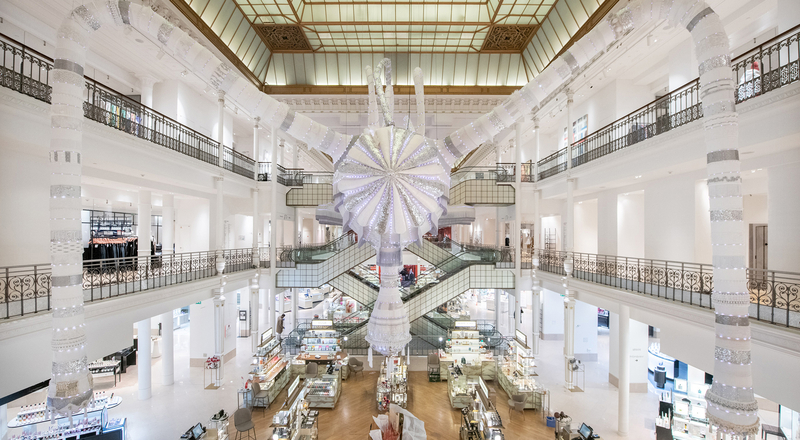 After Ai Weiwei in 2016, Chiharu Shiota in 2017 and Leandro Erlich in 2018, Le Bon Marché has this year given carte blanche to Portuguese artist Joana Vasconcelos, who brings her outsized extravagant creations to the windows and interior spaces of Le Bon Marché. Featuring works of extraordinary dimensions, the exhibition “Branco Luz”, or “White as Light”, runs from January 17 to February 17. An artist who thinks big with an unbridled imagination, embracing both traditional craftsmanship and provocative transgression, Joana Vasconcelos has in recent years emerged as a prominent figure on the contemporary art scene. Her work, which explores the female condition, her favorite theme, is displayed in the world’s most prominent museums. In 2012 she became the first woman to exhibit at the Château de Versailles, joining artists such as Jeff Koons and Takashi Murakami. 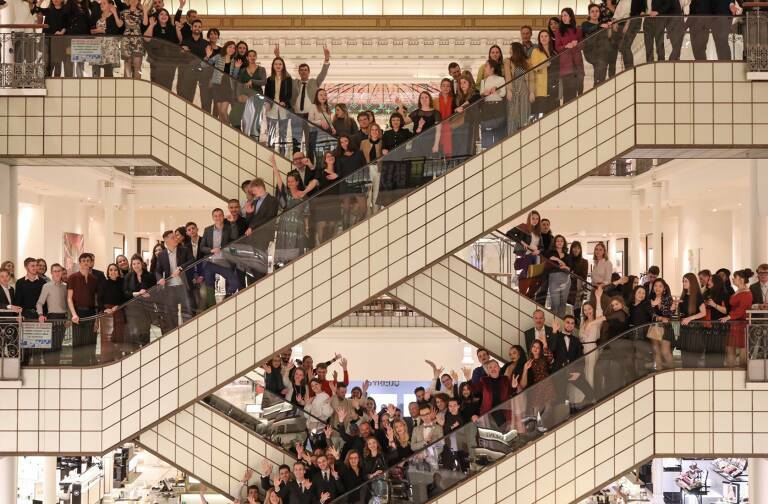 This year the Portuguese artist has created a gigantic aerial suspension for Le Bon Marché entitled “Simone”. 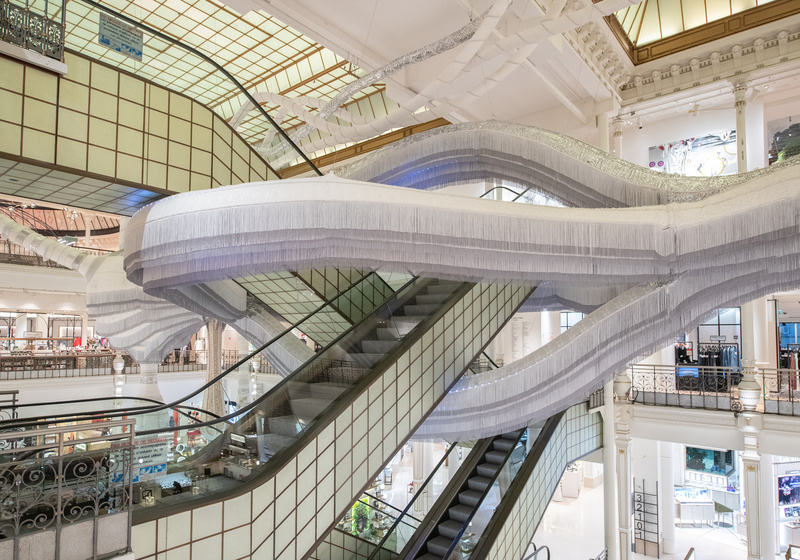 A mythological creature floating under the store’s glass roof above the aisles, “Simone’s” dimensions are truly extraordinary: 10 meters high, 12 meters wide and 30 meters long. Halfway between a flying machine and a giant ant, this is the latest iteration in a series of Valkyries, the mythological female figures who appear regularly in the work of Joana Vasconcelos. Here, their envelope is crafted from a patchwork of fabrics with crochet embroidery and precious trimmings. With an immaculate organic form set off by silvery details and soothing lights, “Simone” fits perfectly with the Art Deco architecture of Le Bon Marché, hugging the escalators and intertwined with the department store’s celebrated iron and steel pillars. “Simone” is joined by a second less monumental installation in the display windows along the rue de Sèvres. 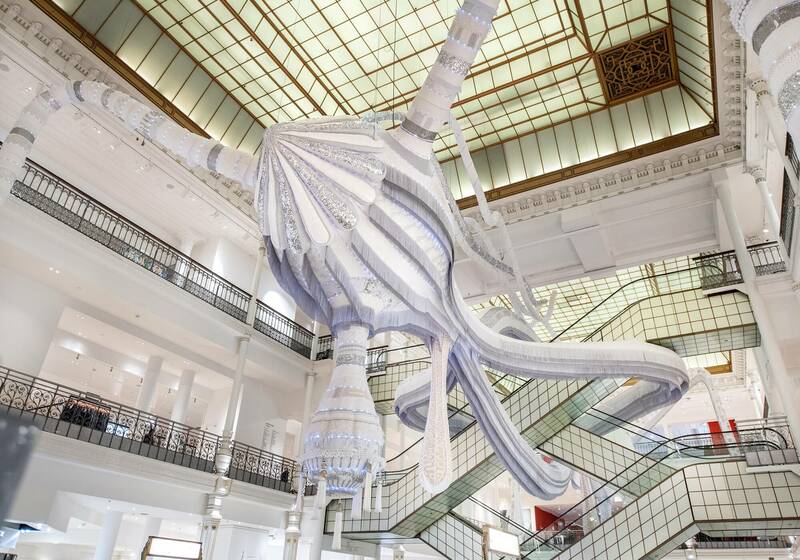 The “Branco Luz” exhibition invites visitors to Le Bon Marché to experience Joana Vasconcelos’ unknown planet until February 17.